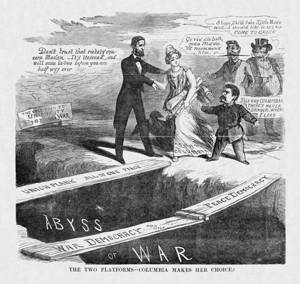 In this postdated cover cartoon for Frank Leslie’s Budget of Fun Columbia heeds Abraham Lincoln’s warning about the Democratic platform, which is dangerously divided between “War” and “Peace,” and accepts the president’s assistance to cross the “Union Plank” over the “Abyss of War.” She carries scrolled documents of the “Rights of Man,” “Constitution,” and “Laws,” while the American Eagle appears in her shadow. Meanwhile, Democratic presidential nominee General George B. McCellan, French emperor Napoleon III (with handlebar moustache) and John Bull, the symbol of Britain, all try to persuade her to take the worm-eaten, rickety Democratic platform, which she rejects. The Confederacy tried unsuccessfully to have the French and British governments officially recognize its independence.